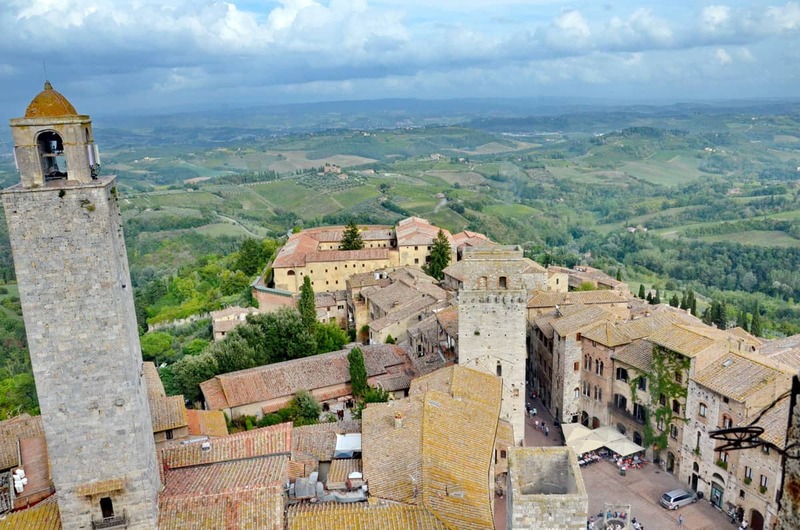 San Gimignano is a well-preserved medieval hill town in the Italian province of Siena that is famous as the town “with a thousand towers”. 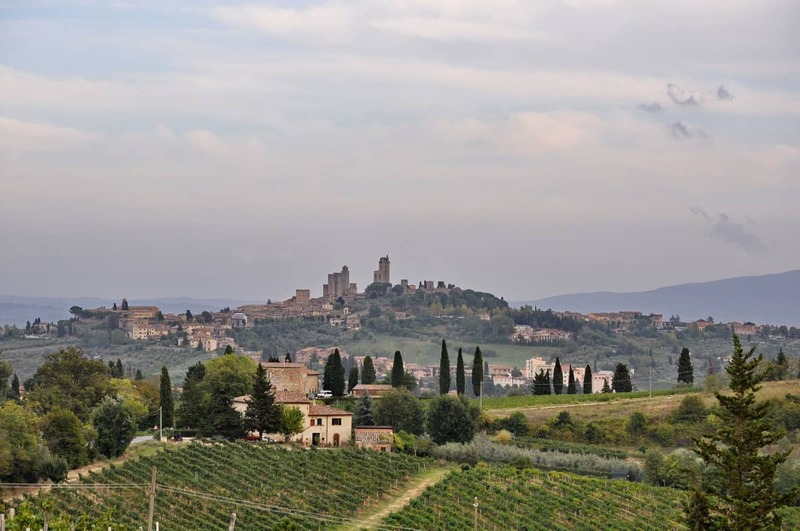 Dominating the horizon from its perch, San Gimignano creates an unforgettable skyline complete with its encircling stone walls and towers. No wonder it was designated a UNESCO World Heritage Site. 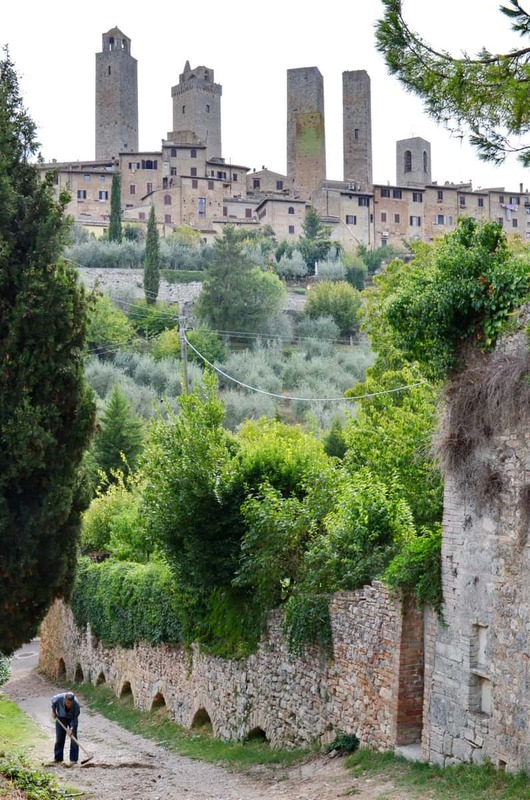 Departing our vineyard retreat in Tuscany in early afternoon for the short drive to San Gimignano saw us passing through some of the most beautiful Tuscan countryside imaginable. 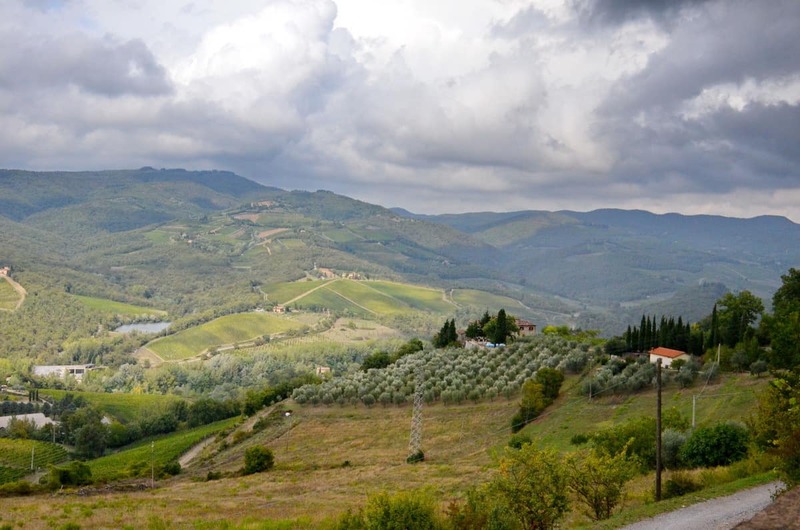 Intermittent grey skies gave way to bursts of sunshine that highlighted the rolling green hills covered with vineyards and olive orchards. It was divine! As Bob and I drew near the walled town, it was a poignant moment to come within arm’s reach of such ancient defensive walls. Adding to the nostalgia of the moment was a lonely worker affecting a repair to the gravel lane with a rustic grub hoe. 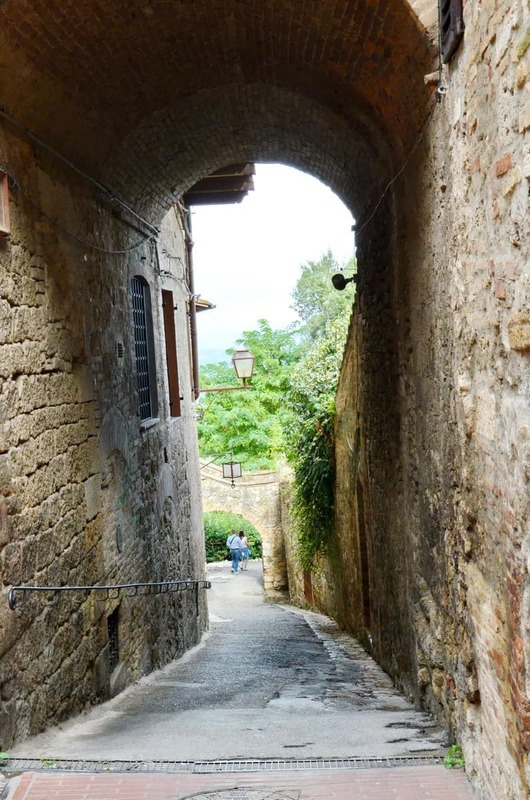 San Gimignano has two concentric rings of defensive walls. The inner wall was constructed during the 10th century, and to add extra protection, a second wall was built in the 13th century. 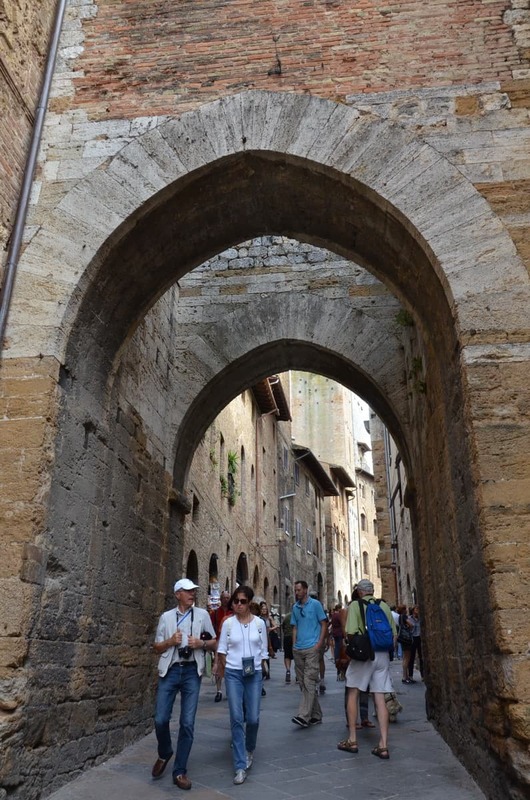 Dwarfed by the scale of the outer wall, we were eager to enter into the well-preserved medieval town. Already, we were afforded views of some of the remaining towers. 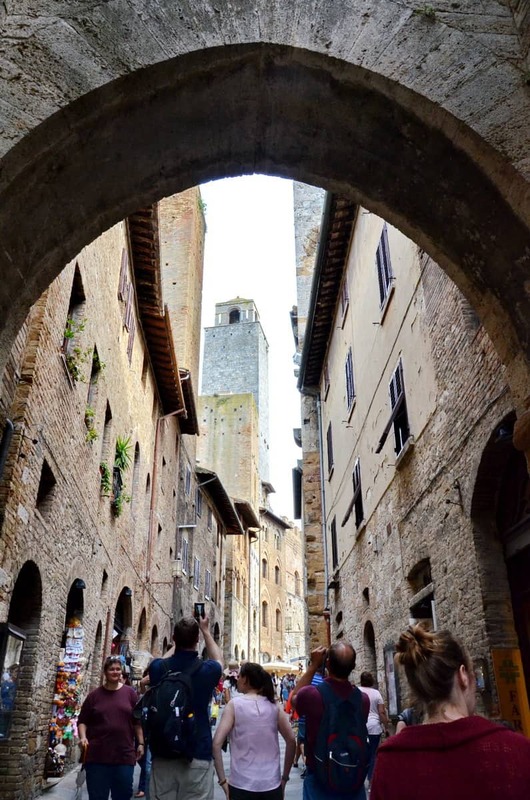 Just walking through the streets of San Gimignano, we were wrapped in the wealth of history that permeates the ancient buildings. 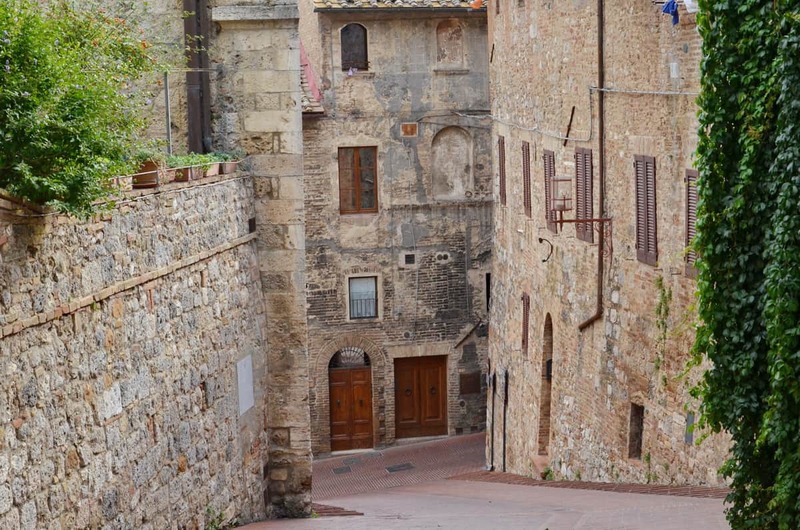 The authenticity of the structures has been preserved and protected by enforcing strict guidelines regarding restoration and forbidding alterations to historic buildings in the historic town centre. and squares. 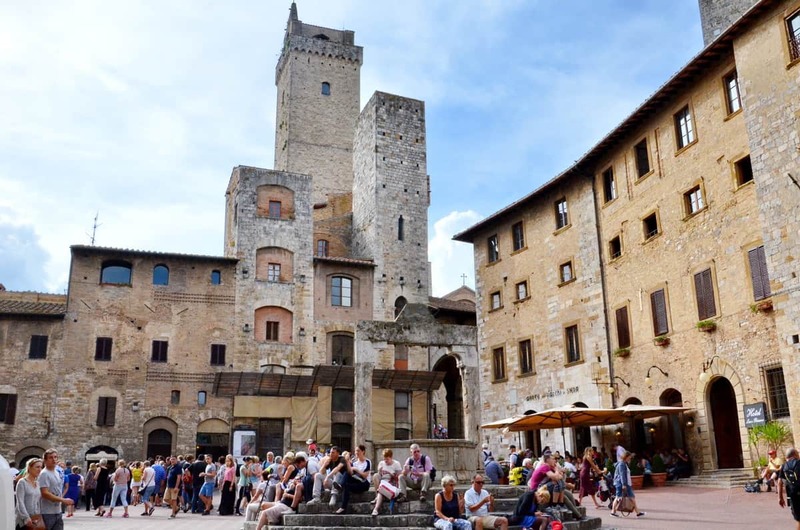 Piazza della Cisterna is San Gimignano’s main town square, and it is shouldered by both Romanesque and Gothic palazzos (palaces) and medieval dwellings. 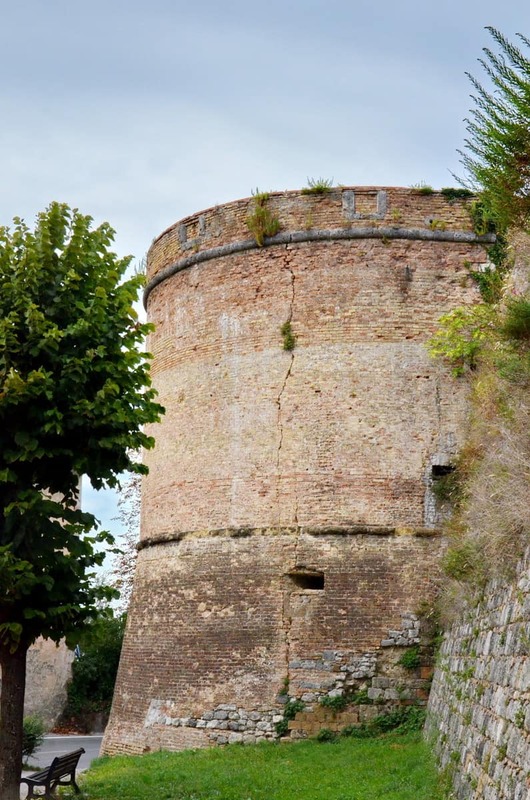 The well or cisterna stands at the centre of the square and used to be the main water supply for the town’s residents. It dates to 1346.
but nothing prepared us for the throngs of people hovering around the well and occupying the Piazza della Cisterna. 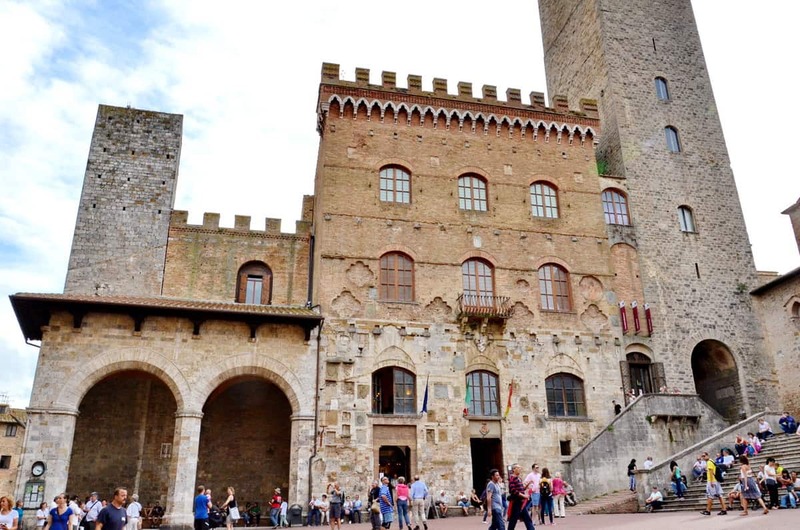 San Gimignano would have been equally as busy during the Middle Ages when pilgrims traveling to and from Rome stopped here to rest. 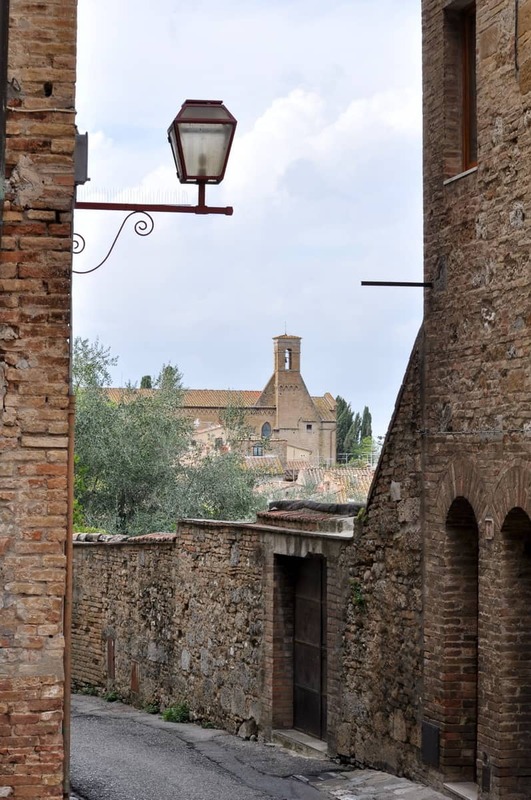 Conveniently located on the ancient road, Via Francigena, that connected France and Rome, the hill town became a popular stopover on the pilgrimage route. 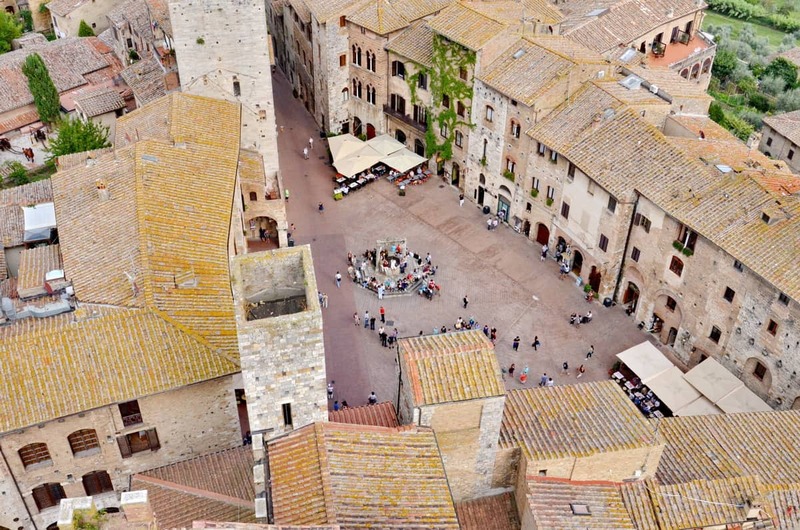 San Gimignano grew around its two principal squares, Piazza della Cisterna and Piazza del Duomo (plaza of the Italian Cathedral). The Collegiate Church proudly overlooks Piazza del Duomo and has its roots in a church first built on the site in the 10th century. 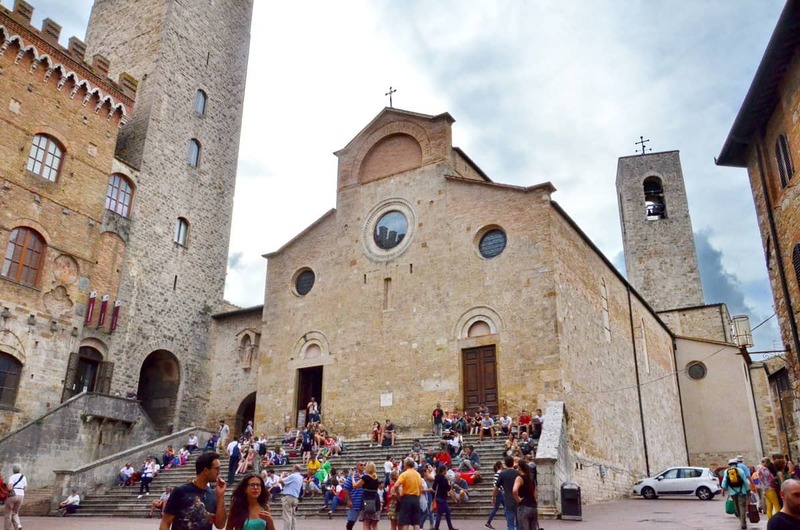 Several masterpieces of Italian art are found within Collegiate Church because it grew in prominence also from the effects of being on the pilgrimage route. Flanking Collegiate Church is Palazzo Communale, also known as Palazzo del Popolo, the Municipal Palace or Palace of the People. 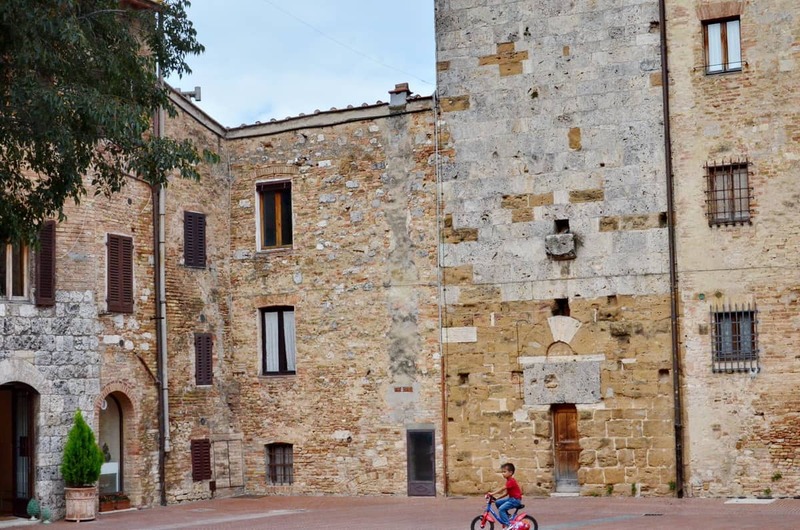 It has been the seat of civic authority since the 13th Century and was built on the ruins of an existing building. 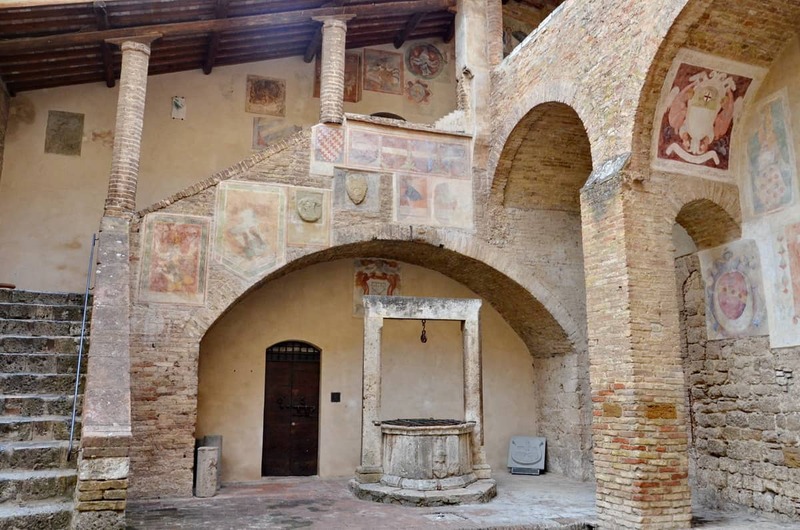 This notable palace is famous for the frescoes painted by Memmo di Filippuccio in the mayoral chambers. Painted in 1303, they are a detailed record of routine daily life in medieval times. 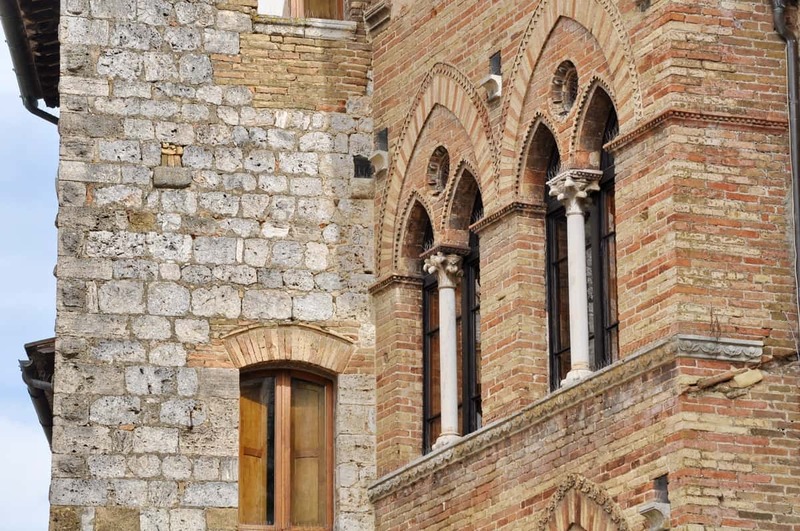 Secreted behind the Romanesque facade of Palazzo Communale is an interior courtyard. Bob and I explored that quaint and private area. Pastel shades of stone are embellished with the coats of arms of those people who once held public office. Adding to the charm is a well that had been constructed in 1323 as part of the amenities for the Palazzo. 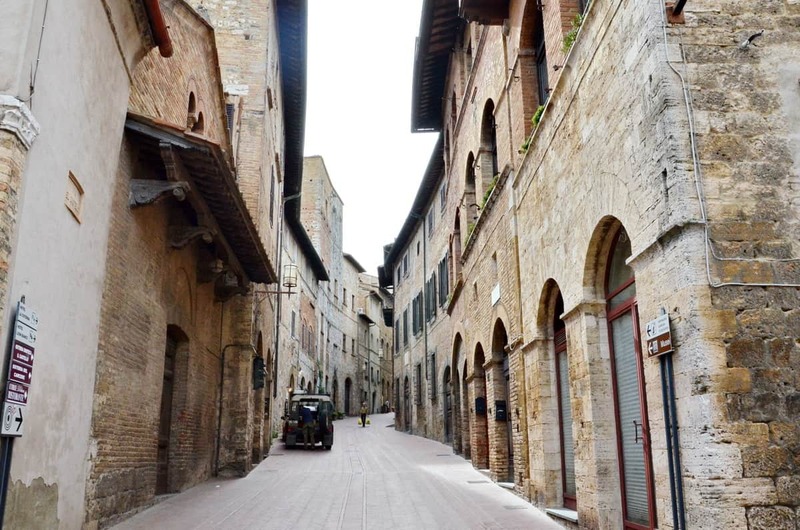 Bob and I soon shook off the crowds by venturing into the warren of narrow streets that radiate from the two main squares and away from the shops and museums. 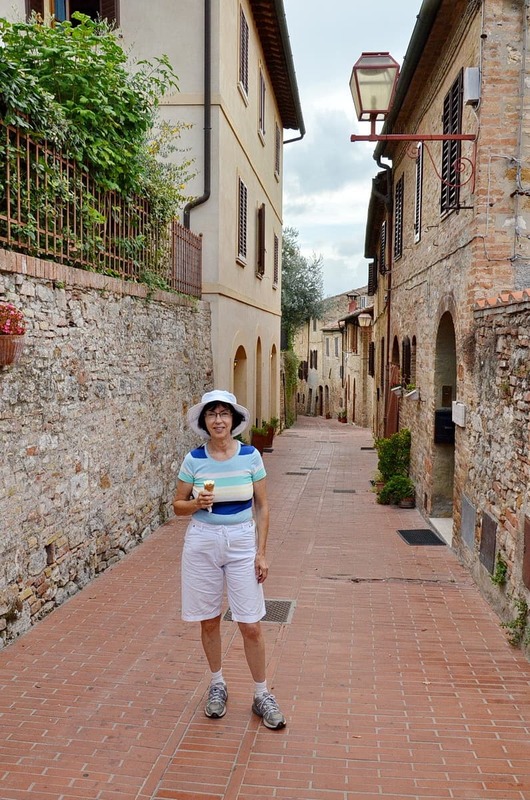 It didn’t hurt to have a delicious gelatto in hand as we explored the nooks and crannies. Residents must treasure their rich surroundings that are a constant reminder of the past. 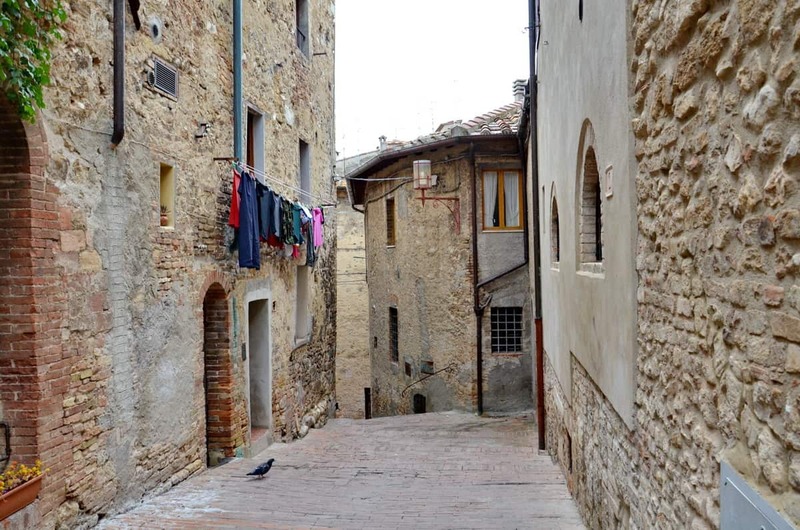 I’m sure their own lives are steeped in the history that has unfolded in San Gimignano over the centuries. Or, perhaps, like this little boy, they give no thought to the stories these walls hold. 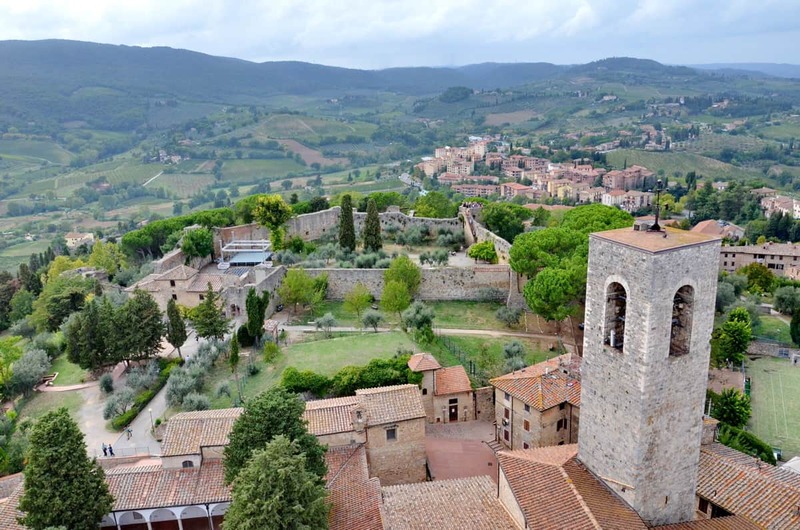 After some peace and quiet, Bob and I were soon ready to focus on the many towers for which San Gimignano is famous. 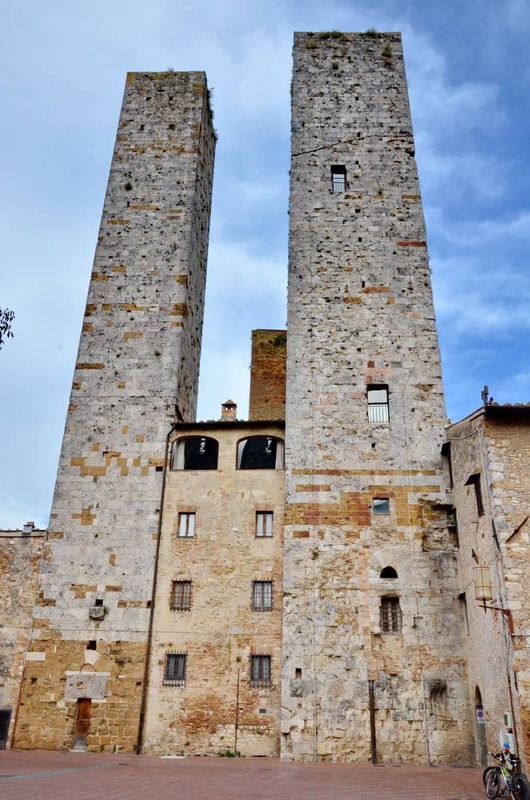 San Gimignano delle belle Torri means “San Gimignano of the beautiful towers”. After the town became independent in 1199, the noble families and upper middle class merchants set about erecting fortified tower houses to indicate their prominence and power. Standing guard over Piazza del Duomo are 2 massive, powerful looking towers called the Salvucci Towers after the Salvucci family who erected them. Like all medieval structures, the base of these towers is square and there are few openings, features that made the buildings easier to defend. Torre Salvucci Maggiore is the tallest of the two Salvucci Towers at 40 metres, but originally they both reached 50 metres into the sky. 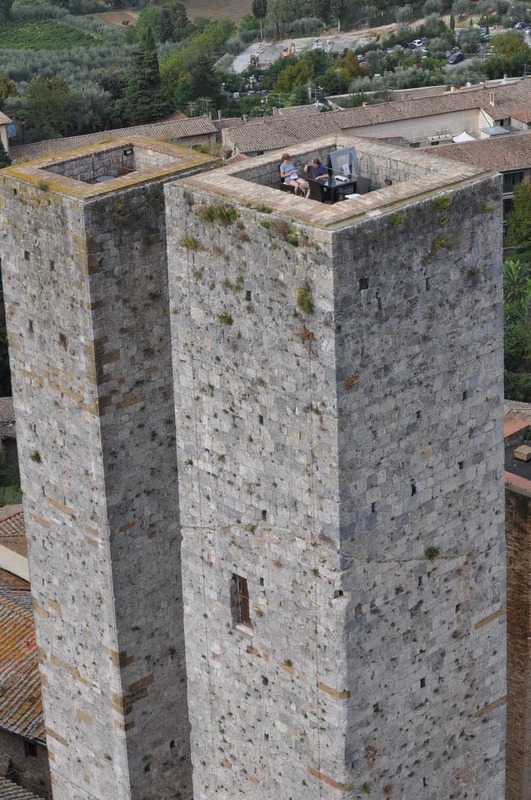 An overview of all remaining towers in San Gimignano was best had from on high so we climbed up the Torre Grossa (Big Tower), one of the towers that is open to the public. The Big Tower was finished in 1311 and stands 53 metres high. It is the highest tower in the town. From its position next to Palazzo Communale in Piazza del Duomo, the Big Tower provides spectacular views of the historic town from several different vantage points. Front and center here are the Salvucci Towers. 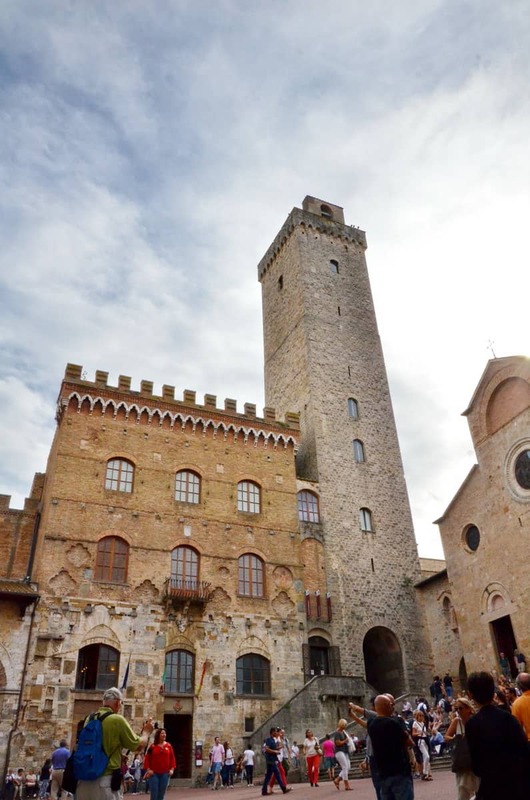 Torre Salvucci Maggiore is the only other tower in San Gimignano that is open to the public. Dominating the skyline in one direction is Torre Rognosa that rises from the original town hall building, Palazzo del Podesta in Piazza del Duomo. 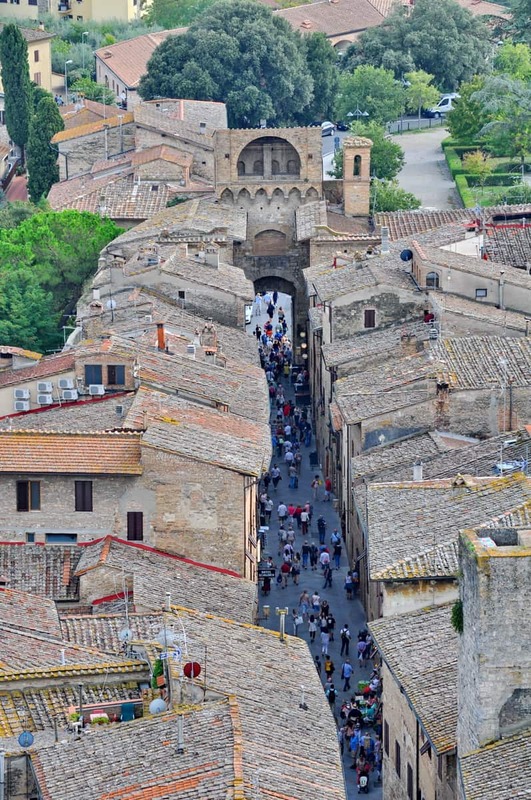 It is the most ancient tower in town and reaches a height of 51 metres. The belfry on top houses a bell that at one time gave warnings of attack, announced special events and marked the hours. 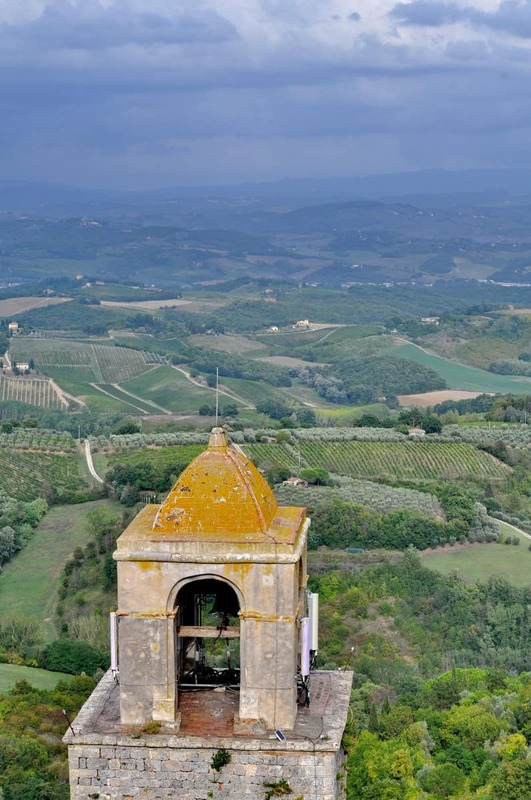 That is why Torre Rognosa is also referred to as the Clock Tower. 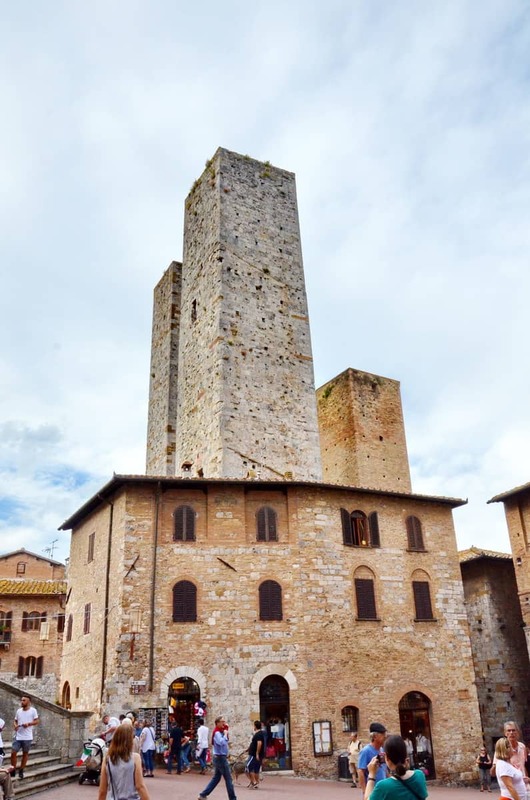 In 1255, a law was passed forbidding anyone to build a tower taller than Torre Rognosa, and the Salvucci Towers had to be cut down to meet that new stipulation. 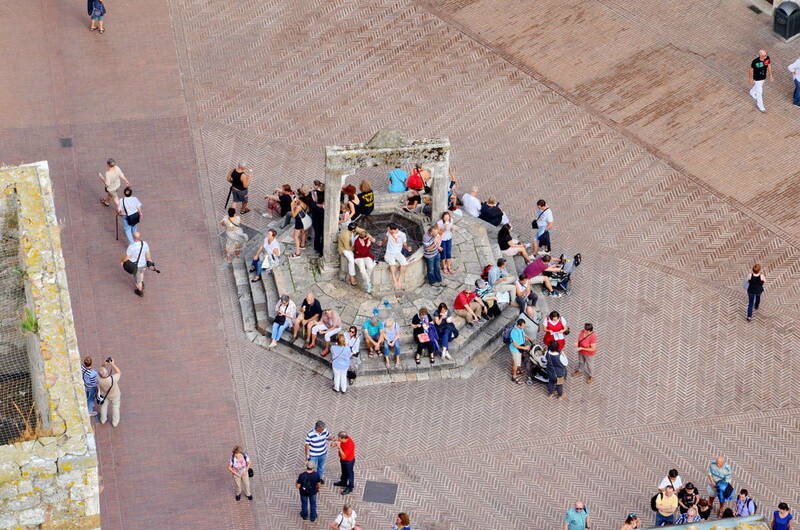 We had a grand overview of Piazza della Cisterna from our lofty perch on Torre Grossa and could actually appreciate the well and its place of prominence in the square. An underground cistern that was built in 1287 gives the square its name. Piazza della Cisterna is formatted in a triangular shape and has a direct passage leading to Piazza del Duomo. It is in this main town square that most festivals and tournaments were held, and the market set up for business. 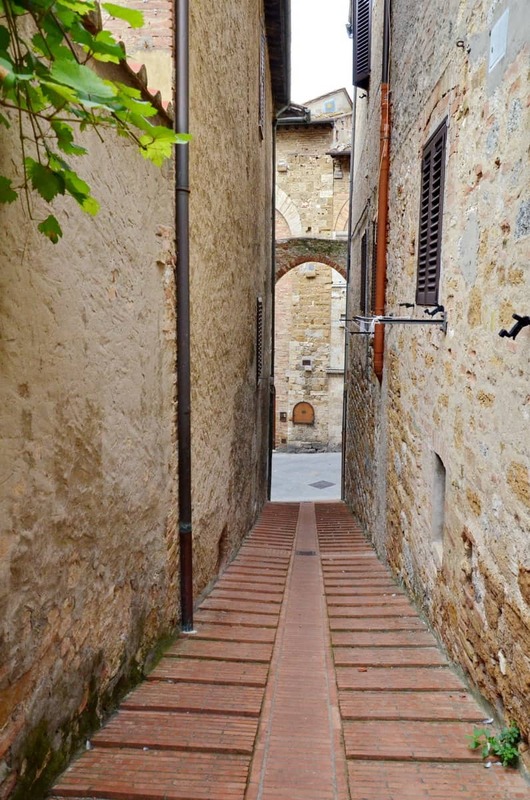 Contributing to the universal value of San Gimignano is the preserved urban layout that was traditional in feudal times. It incorporates elements such as orchards and open spaces into the system of secondary streets, characteristics that are highly visible from Torre Grossa. 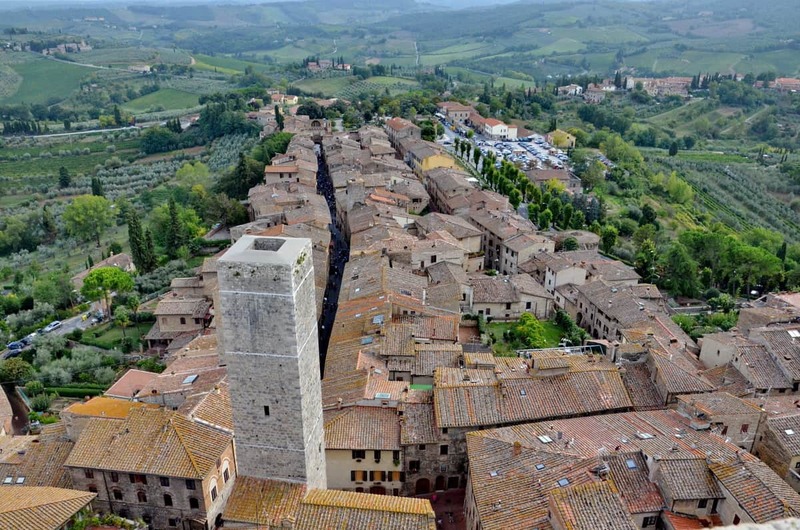 San Gimignano has been referred to as the Manhattan of the Middle Ages because it rose from a small Etruscan village in 990 A.D. into a prosperous centre of commerce during the Medieval Age. Rivaling families out to prove their dominance built stronger and taller towers to prove their stability and power. 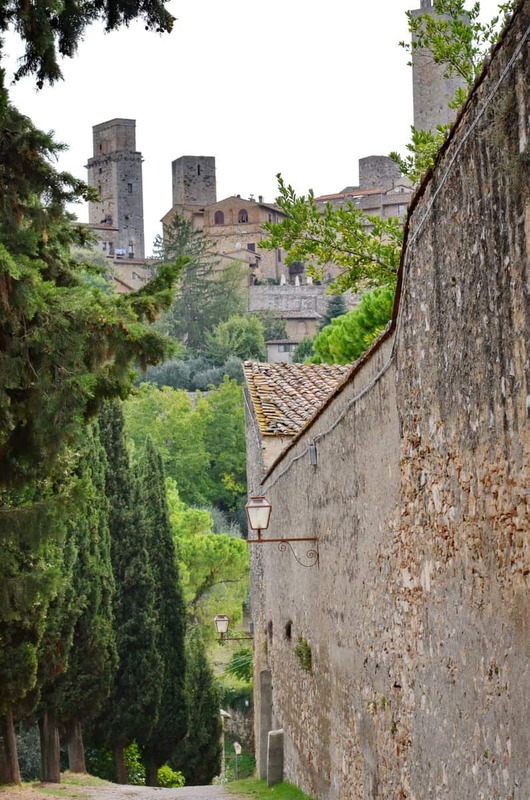 In the end, 72 fortified tower houses, some as tall as 70 metres, rose from the streets of the little hilltop town. 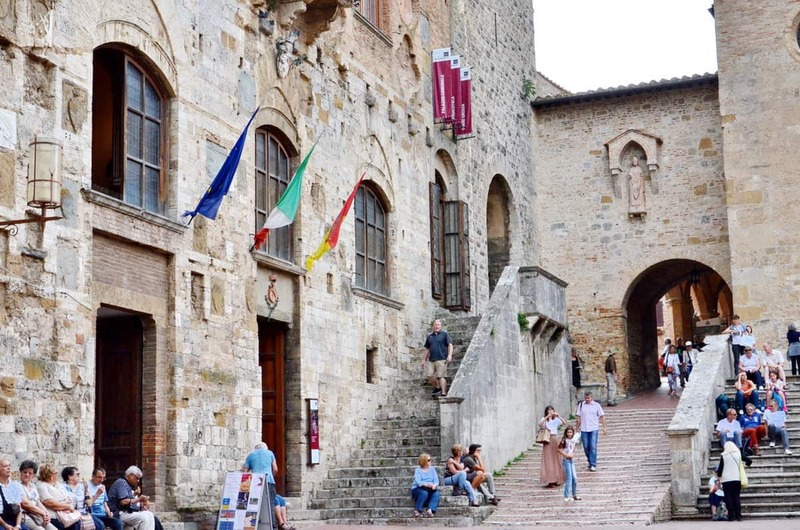 Only 14 have survived, but San Gimignano is still a shining example of a feudal town controlled by rival factions ever-ready for conflict. 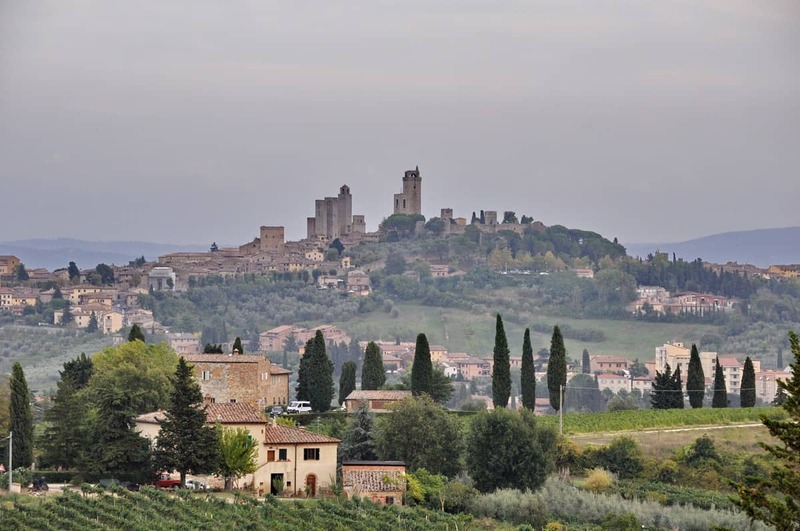 With San Gimignano situated on the pilgrimage route, it developed a burgeoning trade in agricultural products. The fertile neighbouring hills produced not only Vernaccia Grapes for top-quality wine but also highly sought-after Saffron used in cooking and dyeing of cloth. The resulting prosperity funded the building of the expensive towers. and a corner tower along one defensive wall. Then, it was towards a hill in the near distance that we drove to get a look back at this remarkable hilltop town that is a fantastic example of medieval architecture. We were in awe!